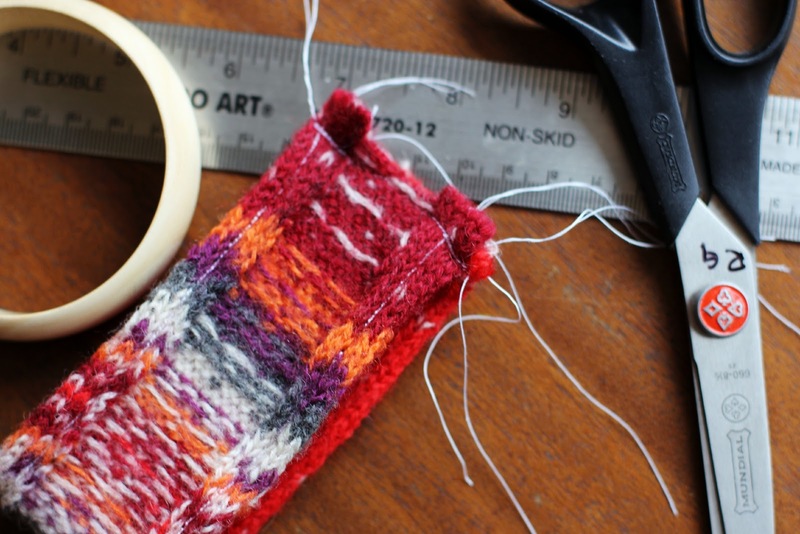 Over the holidays I picked up several thrifted fair isle sweaters that I had planned to use to make some new stockings for our family. One of them in particular was a sweet little red and purple one that I loved but it was a super tiny baby sweater and was badly moth eaten so not really something that could be worn again and in the end a little to small for a full stocking. 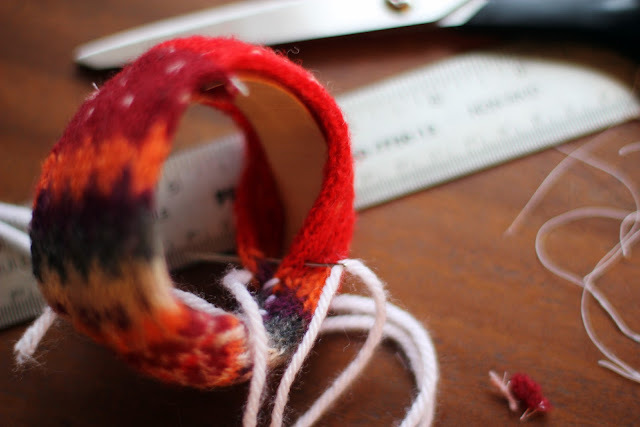 I wanted to use it somehow though because I just loved the print and so I cut it up and set it aside knowing that it would be perfect refashioned as a chunky bangle for the winter months. As luck would have it on Christmas Eve my baby sister Katie gifted me a big chunky hand knit bangle (for the record she hand knitted the big purple one because she has real yarn skills - she always makes such sweet hand knit gifts for us I love it!) and the color matched perfectly to the one sitting on my crafting table at home! It was just enough incentive to finish up the one I had started and I love how it turned out. I thought I would share a little step by step with you today in case you are in the mood to make a stack for the chilly winter months too! 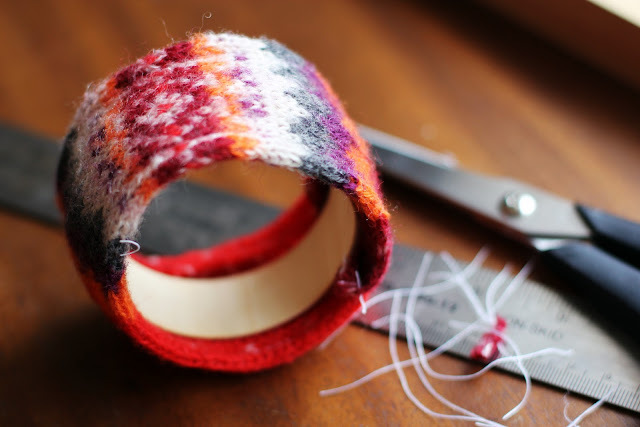 Simply cut a rectangle that is long enough to fit around the bracelet form. 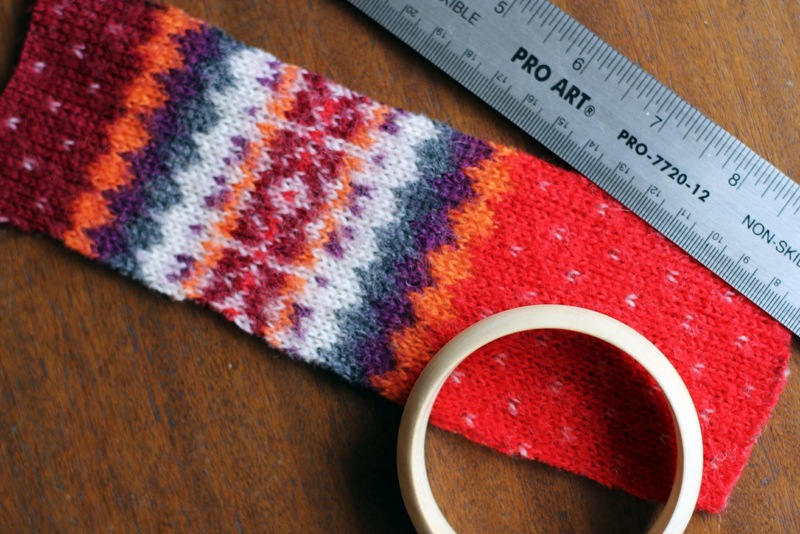 Mine was ten inches around the outside and I ended up cutting it down to nine inches to allow for stretch but all sweaters stretch differently so play with the size a bit. and cut it wide enough to allow for sewing down the edges a bit. Again I really just eyeballed this thing and once the rectangle fit pretty well I sewed about 1/4 inch seams on each side and then sewed the whole thing together inside out at each end...make sense? And used a needle and yarn to hand sew the sweater closed. You could alternately use glue and just glue the sweater down but I wasn't really feeling like fussing with glue on this - if I did use glue I would have used Fabritac my personal favorite! And that was that, simple and quick a fun little accessory to brighten up these long winter days. Hope you have a wonderful week friends and happy Monday! PS. another fun sweater project HERE! What?! I love this! And it's the perfect way to wear bright sweaters that I'm too bashful to wear! what a pretty bracelet! :) love this idea! This is an awesome tutorial and so easy! Thanks for sharing! This is such a great tutorial! So easy! I had that sweater when I was 12 or 13! I loved it because it could go with anything with all those colors :) What a cute idea and it brought back some good memories. Thanks, Rebekah! I love the pops of color in the sweater pattern you chose. 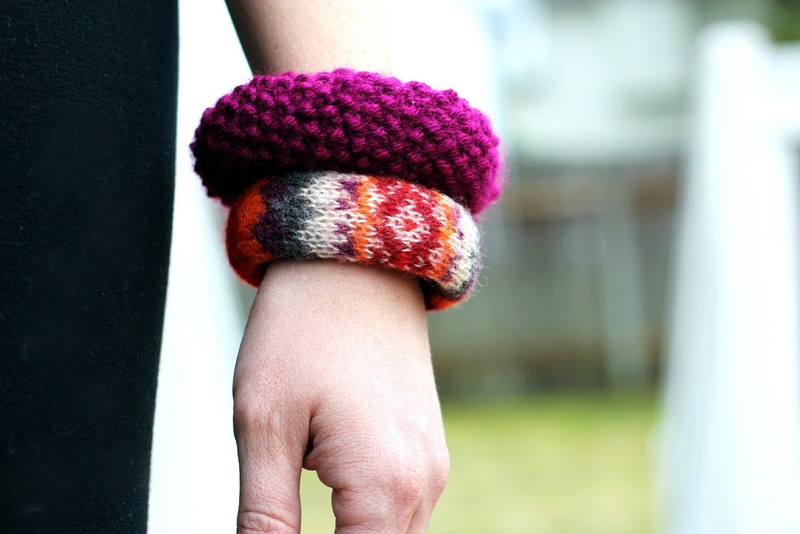 Love this idea so much that I featured it in my blog roundup today: http://blog.mixbook.com/make-your-own-accessories/ Thanks for the inspiration! Great idea! Martha Stewart had the same ones featured on her site back in 2008. This is fantastic! Thanks for sharing. This is such a cute idea! I have recently gotten into knitting and this is a great thing that I could try. I also love that they are bangles! 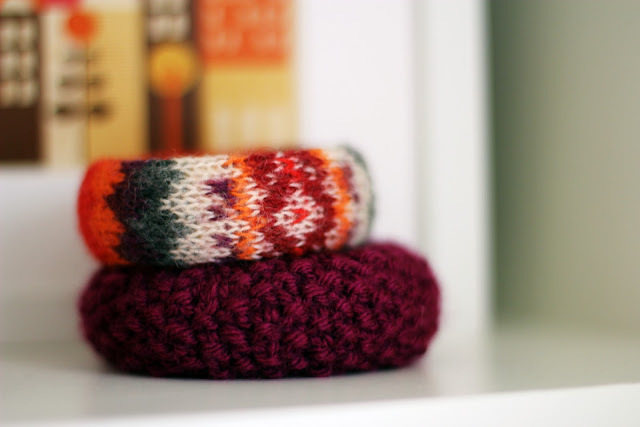 I would love to get some bangles for my baby, and I might even try to make her one like these! Thanks for sharing your cute DIY! Copyright © 2012 All Rights Reserved Rebekah Gough/A Bit of Sunshine . Powered by Blogger.